Hello, I’m Cyrene and welcome to my life! Let me start with my roots. My parents were childhood sweethearts. They were so in love, and when I came into existence, together we formed a happy family. I was the first grandchild of the family on both my Mum’s and Dad’s sides. Then sadly, when I turned two, a very tragic event happened… I lost my Dad due to an accident. About four or five years after, my Mum re-married and we became an even bigger family! I became an instant sister to my five step-siblings: four brothers and one sister. I grew up helping my Mum take care of my younger siblings. And the role of being the eldest helped me mature early and taught me to be responsible and caring. 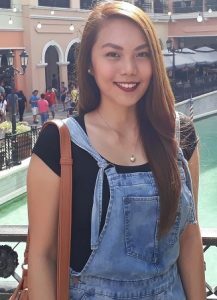 I have a Bachelor’s Degree in Science in Nursing through the help of my uncles and aunts – as they promised my Dad they would help and support my educational needs. After graduation, I took the board exams three times, but had no luck in claiming my license – I guess it simply was not to be. In 2011 I started working in the BPO industry. I was assigned to a UK Telco company, and that’s where I met my boyfriend of six years. Fast forward to 2016, I heard about ‘work from home’ opportunities, but there was a struggle in landing a job. I was scared of being scammed (not being paid after performing the work). So I did some research and joined some online platforms and groups. The thought of me working remotely was exciting because I no longer wanted to waste time traveling to work and struggle through the everyday traffic of the metro. Good things started happening in 2017. That’s when I made the decision to resign from the BPO office and officially started working from home. Apart from fulfilling my dream job, another blessing came… at the end of October I discovered I was pregnant with my first child. Then December last year my husband and I had our church wedding. Now that I have my own family, my desire for working from home has been strengthened. And there’s a little one who inspires me and motivates me to do my very best. I also want to help my husband in securing our little one’s future financially without being away from them. Thanks for reading my story! I hope you’ll consider me when seeking your Virtual Assistant. For a copy of Cyrene’s resume please click here.